NEW DELHI -- South Korean President Moon Jae-in arrived in Singapore on Wednesday for a three-day state visit that will include a meeting with his Singaporean counterpart and a summit with Prime Minister Lee Hsien Loong. Moon's trip to Singapore followed his four-day state visit to India. It is the first state visit to Singapore by a South Korean president in 15 years, according to Moon's presidential office Cheong Wa Dae. Moon's state visit will begin with an official welcoming ceremony Thursday, followed by a meeting with his Singaporean counterpart, Halimah Yacob. The Moon-Lee summit will be held later in the day followed by a joint press conference and a state dinner. 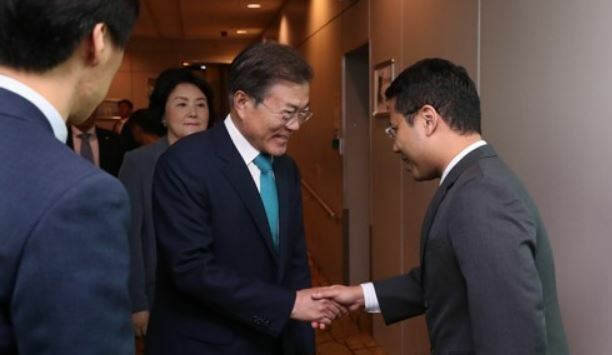 "Through his meeting with the president of Singapore and talks with the prime minister, President Moon will evaluate the results of cooperation between the two countries so far and discuss ways to enable future-oriented cooperation between the two countries based on such progress," Cheong Wa Dae spokesman Kim Eui-kyeom said earlier. Singapore is currently serving as the chair of the 10-member Association of Southeast Asian Nations. The Moon Jae-in administration is actively seeking to upgrade its ties with India and the 10 ASEAN member countries under its new foreign policy, known as the New Southern Policy. While in India, the South Korean leader sought to promote co-prosperity and peace in the region. Moon is again expected to stress regional efforts to ensure peace and prosperity while meeting with Singaporean leaders. His visit to Singapore follows a historic summit between US President Donald Trump and North Korean leader Kim Jong-un held here on June 12.